Bobby Kennedy had seen Harlem, the South Bronx, and Bedford-Stuyvesant. But what he witnessed in the Mississippi Delta in 1967 would impact the last 14 months of his life. Paul Schrade was shot in the head the night Bobby Kennedy was killed. A longtime friend of RFK, he tells us what he knows, what he witnessed, and what he thinks. Was Sirhan Hypnotically Programmed to Assassinate RFK? In an exclusive video, Sirhan Sirhan’s legal team documents its 11-year quest to unlock Sirhan’s memory of the RFK assassination. A collection of videos of some of Robert F. Kennedy’s best speeches. Chris Matthews shares a soulful, insightful, and highly personal look at Bobby Kennedy. 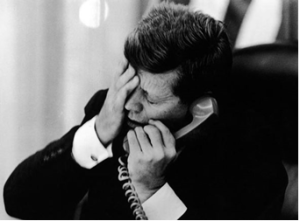 What Did the Death of Bobby Kennedy Mean? How might the world be today had Bobby Kennedy lived? And who was behind his death? Paul Schrade, one of his closest confidants, who was also shot that night, looks back. Denying parole to a 71-year-old with a record of good behavior not only defies logic but also current California policy. So why is Sirhan Sirhan kept in prison? For over 40 years, Paul Schrade has campaigned to reopen the investigation into the RFK assassination. Eyewitness testimony, the autopsy report and an audio recording of the shooting all strongly suggest that two guns were involved and that Sirhan could not have fired the fatal shot.